raising broilers and want them to bulk up as quickly as possible. which means they put on body fat and lay larger (but fewer) eggs. of money to get there. comes running when they see your face. 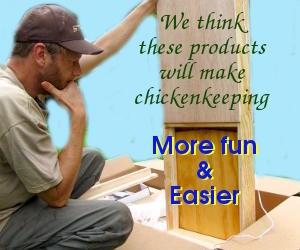 summer and 0.33 to 0.40 pounds per chicken per day in the winter. haven’t been brave enough to try yet. with clean water from our chicken waterer. I don’t have chickens just researching getting ready for them. You said “You’ll also want to reduce the protein content to about 15.5% during the cold month”.. Why would I do that? I would think without them hunting for bugs cuz there are none they would need more protein from me. Angie — Good question. The reason you lower the protein percentage in winter is that you’re often feeding the chickens a larger amount of feed so they can keep themselves warm. So, your birds get the same total *amount* of protein due to a larger ration, but they get a lower *percent* protein since the chickens are getting more carbs than in the summer.